Traditional arguments for maintaining riding quality of pavement are expanded in this paper to examine the effects of deteriorating riding quality on vehicle operating costs, freight damage and logistics. The objectives of this paper are to analyse the effects of different levels of riding quality on a truck and its freight, and to discuss potential applications of the analysis in terms of effectiveness of the freight transport system. The paper discusses needs and drivers influencing freight transport costs, vehicle-pavement interaction concepts, and the potential physical effects and costs from roads with deteriorating riding quality. A case study is presented analysing vehicle-pavement interaction for selected roadways in California. It is concluded that investments in pavement and freight transport industry improvements can be investigated by applying vehicle-pavement interaction analysis to evaluate damage to pavement, vehicle and freight that would result from alternative levels of pavement riding quality. The paper recommends that existing concepts, tools and resources such as dedicated truck lanes and vehicle-pavement interaction analysis can help to improve the freight transport system. A framework is proposed to better understand the scale of potential impacts of riding quality from localised effects to larger-scale influences, including costs to customers and global competitiveness. Highways are the primary means of transporting people and freight in the United States (US) (Lambert 2003). A reliable land transportation system is essential to a robust economy (Transportation Research Board (TRB) 1994). Issues and concerns about ways to improve the transportation system are broad, complex, and controversial (Burks et al 2010). This paper examines the effects on freight transport vehicles, freight damage and logistics, and pavement infrastructure based on quantitative measures of Vehicle-Pavement Interaction (V-PI). Traditional arguments for maintaining riding quality of pavement are expanded in this paper to examine the effects of deteriorating riding quality on Vehicle Operating Costs (VoCs), freight damage and logistics, which have downstream impacts on costs of goods and ultimately on a nation's economy. 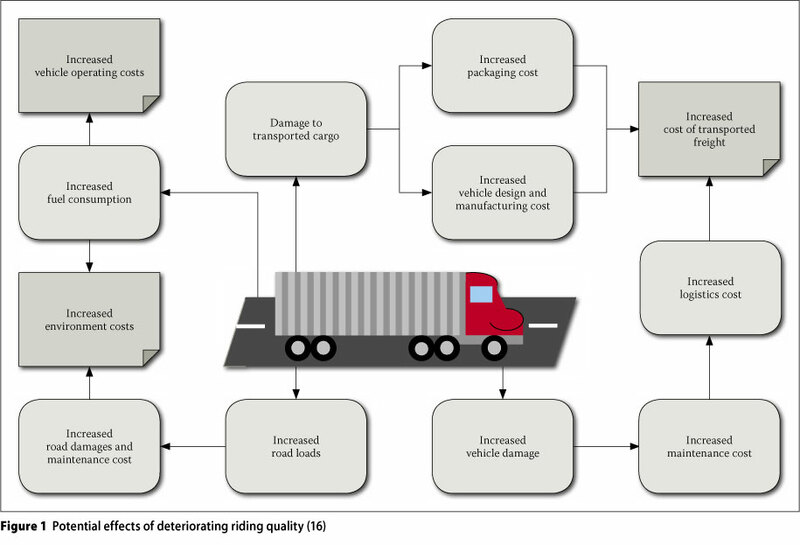 The objectives of this paper are to analyse the effects of different levels of riding quality on a standard US truck (from dynamic loads applied to the pavement) and its freight, and to discuss potential applications of the analysis in terms of effectiveness of the freight transport system and implications. The paper starts with an evaluation of the needs and drivers that influence freight transport costs, and reviews transport infrastructure and freight statistics in the US and California. V-PI concepts are introduced and the potential physical effects of deteriorating riding quality are discussed. This is followed by an evaluation of the costs of roads with low riding quality and a case study V-PI analysis for two roads in California. A framework is proposed to better understand the scale of potential impacts of riding quality from localised effects to the broader economy and global competitiveness. Recommendations are made to expand the scope of the process to more countries and vehicle types. The major needs and drivers influencing freight transport costs on a road network are shown in Table 1. Freight transportation is the backbone of US commerce with imports and exports typically doubling every ten years (CAGTC 2008). The US transport system serves seven million businesses that depend on it to move goods to markets, mainly using trucks (Bureau of Transportation Statistics (BTS) 2007). Transport costs represented 10.1% of the Gross Domestic Product (GDP) of the US in 2007 (Council of Supply Chain Management Professionals (CSCMP) 2008). The US has approximately 6.4 million km of highways, representing 38% of the transportation capital stock in 2005 (BTS 2007; US Climate Change Science Program (USCCSP) 2007). The overall condition of US interstate highways generally improved between 1995 and 2005, although rural and urban collectors and urban minor arterials showed a higher percentage of roads in poor or mediocre condition (BTS 2007). Highway system condition has fallen behind escalating use, creating traffic gridlock and delayed business deliveries. Over 256 000 km of the National Highway System need resurfacing or reconstruction (CAGTC 2008). California's State Highway System (SHS) consists of around 24 200 centreline-km (479 000 lane-km) with 79% classified as freeways and expressways (California Highways 2011). In 2007 the California Department of Transportation (Caltrans) classified 25% of the SHS as being in Total Distressed Pavement condition (low riding quality and/or structural distress), 32% as requiring Corrective or Preventive Maintenance, and 41% as being in Excellent condition (Caltrans 2008). California had six of the ten roughest urban road networks in the US in 2004, causing road users in California's biggest cities to pay as much as $700 annually for repairs and early vehicle replacement costs, compared to the national average of $400 (Lawson 2006). It is estimated that keeping roads from getting worse would require a 32% increase in annual funding, while a 62% increase is required to improve them. Without timely repairs the road network will require major rehabilitation and reconstruction that will increase costs by a factor of four to five over the current maintenance costs. About half of motorists' rough road tax is spent on tyre replacement, wasted fuel and repairs to suspension systems, while the other half is a portion of the costs for having to replace vehicles more frequently because of the condition of roads (Lawson 2006). Pavement riding quality is used as one of the primary indicators of the condition of the pavement (Sayers et al 1996). Deteriorating riding quality translates into negative impacts on road users (motorists and truckers) and agencies that own/operate the roads. Various studies show that pavement riding quality affects the vibrations and responses in vehicles (Singh et al 1991; Slaughter et al 1998; Steyn & Visser 2001). The main conclusion from all these studies is that lower riding quality is a major cause of increased vibrations and subsequent structural damage to vehicles. Studies indicate that more heavily loaded trucks showed higher lateral and longitudinal levels of vibration than lightly loaded ones. Trailer vibration levels typically decrease with reduced speed over rough surfaces. In a continuing study that forms part of the South African State of the Logistics effort (Steyn et al 2011), a database of VoCs for an operational fleet of 577 trucks indicated that trucks travelling on roads with poor riding conditions experienced increased suspension replacement costs of between 685% and 1 560%. Short-term highway maintenance cost savings obtained by postponing pavement rehabilitation are realised by the transportation agency and do not include higher vehicle costs from wear-and-tear caused by pavements with lower riding quality. Life-time VoCs are typically four times the initial construction costs of a highway, while highway maintenance is only 1 to 2% of the total road transport costs. Neglect of highway maintenance can cause an increase of up to 15% in VoCs, while further neglect of maintenance will cause a paved road to start disintegrating with further increases of up to 50% in VoCs (Robinson 1987). International trade increased steadily in recent decades rising about 12% (as percentage of GDP) in the 1970s to about 25% in the 1990s. Explosive growth, improvements in manufacturing processes and new technology are continuing this trend, increasing the strain on trade gateways (CAGTC 2008). More than 40% of containers moving through the US are transported through California (McKim 2011), with an average annual growth rate of 9.4% since 2001 (BTS 2007). The trucking industry is a crucial part of the modal mix, particularly with trucks typically acting as the "last mile" service pro-vider, bringing goods directly to consumers (USCCSP 2007). The agricultural sector accounts for nearly 30% of all freight transportation services in the US, making it the largest single user of the US and California freight transportation networks (FTA 2008). Studies on the effects of freight vibration of fruit caused by low riding quality found that differences between the levels of vibration-induced damage during transport may be attributed to mechanical differences between trailers, as well as road condition. Fruit damage was found to be greatest in the uppermost container for every combination of road, truck type and travelling speed, which also corresponded to the highest vibration levels measured in the container (Slaughter et al 1998; Bundit et al 2005). The pattern of adverse effects on freight caused by pavements with low riding quality is not expected to be restricted to the agricultural sector and could have wide-ranging cost impacts, e.g. vibration effects on sensitive electronic components in freight. Testimony to the Senate Committee on Agriculture, Nutrition and Forestry in 2005 observed that, "This U.S. transportation system is turning from a strength into a potential weakness. Because of higher fuel and energy costs, congestion on railroads and highways, a lack of investment in modernisation and maintenance of the inland waterway system, the costs of moving agricultural products to markets is escalating sharply." (CANF 2005). Also, the American Association of State Highway and Transportation Officials (AASHTO) cited freight movement in its ten top priorities for 2011 (AASHTO 2010). Failure to invest in freight transportation will lead to increases in congestion, slower movement of goods, diminished capabilities to access critical international markets and increases in consumer prices. Road congestion costs the US economy around $63.1 billion in 2001. Current road congestion levels, budget limitations, effects of road condition on transport costs and forecasts of dramatic traffic volume increases all suggest that the highway system will fail to meet demand in the near future (CEC 2011). The entire US vehicle fleet logged nearly 4.4 trillion km in 2000 representing a 22.4% increase in total annual Vehicle Km Travelled (VKT) since 1992 (FHWA 2003). The steady annual increase leads to an expected 6.48 trillion VKT in 2020 (47% increase relative to 2000). The California Department of Finance projects a 31% population increase (CDOF 2002), which, when combined with Federal Highway Administration (FHWA) data (FHWA 2003), suggests a possible traffic volume increase in California of about 83% between 2000 and 2020. The growth of truck traffic volume has outpaced that of passenger vehicles (Lambert 2003), which is significant, because service lifespan of pavements is related to truck traffic (Samuel et al 2002). Road transport logistics consists of planning and implementing the acquisition and use of resources for freight movement on roads (Cass Logistics 2000). More than 40% of the difference in economic performance of low- and high-growth countries can be explained by differences in the effective use of infrastructure (Rulistia 2008). This has significant importance for the economic development of a country such as South Africa. Deteriorating roads lead to delays, higher costs for road users and taxpayers, vehicle and freight damage and greater risks of accidents. Logistics costs in the US changed from 12.3°% of GDP in 1985 to an all-time low of 8.6% of GDP in 2003, compared to 13.5% of GDP in South Africa in 2009 (SOL, i.e. State of Logistics) (CSIR 2011). Total US logistics costs have risen by 52.3% over the last five years. Transportation costs rose 5.9% during 2007 and now account for 6.2% of nominal US GDP, similar to levels experienced 20 years ago (Schulz 2008). A major challenge to supply-chain logistics in the US is highway congestion and port delays combined with the need for a long-term vision in highway infrastructure improvement and sustainability. Optimal energy use requires the evaluation of traffic flow characteristics, since constant speeds enhance optimal energy use and generally reduce travel times. Exclusive truck-only facilities may assist in improved productivity and lower energy use (Roorda et al 2010). The transportation sector used 19% more energy in 2006 than in 1995, consuming 67.9% of US petroleum usage in 2006 (BTS 2007). Long-term pavement studies at the WesTrack test facility found increasing pavement roughness increased fuel consumption of trucks by 4.5% (under otherwise identical conditions). Higher roughness also increased the frequency of fatigue failures of truck and trailer components (Sime et al 2000). US transportation energy use is expected to increase by 46% from 2003 to 2025, mainly due to economic growth. The most widely proposed fuel options are increased vehicle fuel economy, increased prices for carbon-based fuels, and developing alternative and renewable fuel sources (USCCSP 2007). The environment links directly to energy and logistics. Improved logistics generally lead to lower energy demands and environmental impacts. The US freight transportation network is the second-largest source of GreenHouse Gas (GHG) emissions in the US, after electricity generation. US road transport contributes approximately 18% of total global CO2 emissions and around 14% of GHG emissions, making it one of the three major contributors to these emissions (BTS 2007). While emissions from light-duty vehicles are expected to drop 12% by 2030, freight truck emissions are projected to increase 20%. Truck GHG mitigation strategies include recommendations such as system optimisation and operational efficiency improvements through decentralised supply chains, less excess packaging, reduced shipment frequency, congestion mitigation measures and advanced vehicle technology (CEC 2011). Reductions are possible by improving road network performance. A Norwegian study concluded that better road alignment, coupled with sufficient width and infrastructure capacity, led to decreases of between 11 and 61% in CO2 emissions (IRF 2007). V-PI describes the vehicle components, pavement components, and the ways in which these influence one another. Pavement riding quality influences the vertical dynamics of the moving vehicle. The resulting dynamic tyre loads cause pavement responses which lead to pavement distress. Under repeated loading of heavy vehicles the profile changes further, leading to further changes in dynamic tyre loads. The pavement structural strength reduces over time, due mainly to cumulative effects on pavement responses. The net effect on pavement distress will depend on the spatial relationship between dynamic tyre loads, pavement profile changes and pavement structural strength variations (DIVINE 1997). Pavement roughness indices provide quantified riding quality values and trends. The International Roughness Index (IRI) is widely accepted as the index of choice for reporting pavement roughness. IRI is most appropriate when a roughness measure is desired that relates to overall VoC, overall riding quality and overall surface condition (Sayers and Karamihas 1998). It is noteworthy that IRI was intended to reflect pavement roughness attributes that affect riding quality of passenger vehicles, and not intended to describe pavement roughness characteristics affecting heavy trucks, because it does not show sensitivity to excitation frequencies observed under heavy vehicle traffic (Papagiannakis and Gujarathi 1995). Vehicle response to the pavement profile can be modelled in the frequency domain as a response function. Mathematically, the vehicle frequency response function acts as a multiplier to the input road profile Power Spectral Density (PSD) to give the PSD of the vehicle response. This combined frequency characterisation of road profiles and frequency domain analysis of vehicle responses to the profile has resulted in the road profile being categorised into eight classes (A to H, from smooth to rough), as set by the International Organization for Standardization (ISO) based on PSD (ISO 1995). In studying the interaction between vehicle and pavement, the objective is to determine how the vehicle and pavement components affect one another in order to determine the resultant effects on the pavement, vehicle components and freight. There are three standard components in the majority of the vehicle-pavement interaction evaluations (DIVINE 1997; Collop & Cebon 1995). They are (1) the cause of the problem (pavement profile), (2) the load history generator (the vehicle and freight) and (3) the component on which the forces are exerted (the pavement structure). This paper focuses on pavement performance and maintenance, vehicle damage and operating costs, and freight damage and logistics. The performance of pavements over time depends on construction quality, traffic loading and environmental conditions. A rough pavement surface increases moving dynamic loads, resulting in higher than average pavement deterioration, shortening pavement service life. The simplest way to reduce pavement deterioration caused by V-PI is high quality, smooth pavement construction and timely maintenance that ensure high riding quality. Riding quality directly influences the quality of the driving experience for vehicle occupants and freight. Steyn et al (2011) identified the potential effects of deteriorating riding quality on the broader economy (Figure 1). Decreasing pavement riding quality, and the increased dynamic vehicle loads it induces, cause direct increases in pavement maintenance costs, shortened pavement service life, and ultimately higher costs for a given pavement structure and transported freight. Driving on a pavement with low riding quality affects the speeds at which the vehicle can travel safely, immediately affecting the logistics of delivering goods at optimum times to consumers. It also raises fuel consumption and increases carbon emissions for the same amount of freight delivered. In an evaluation of road maintenance requirements in sub-Saharan Africa, Heggie (1995) calculated that for each $1 spent on road maintenance, between $3 and $22 VoC is saved. Values in other studies may differ, but the pattern of return on investments in road maintenance is typical. Potential damage to vehicles travelling on rough roads can be addressed through improved design of each vehicle, which multiplies the costs to all travelling vehicles. Low riding quality thus has an increased cost effect on vehicle design, manufacturing and maintenance. All these costs are routinely incorporated into the costs that the vehicle owner charges for transporting freight, the logistical costs and ultimately the costs of goods paid by the consumer. Lower riding quality affects the environment and environmental costs through increased VoCs, increased emissions due to slower speeds and longer durations of transport, increased use of natural resources, and increased costs as more materials are required to maintain pavements. Increased vibrations result in more vibrations translated to the freight and resultant freight damage. Various methods exist for establishing the expected damage to freight exposed to ranges of vibrations and shock loads. Potential solutions to this problem include improvements in freight packaging and in the design of the freight itself, but both of these solutions add further costs. The costs of packaging of fresh produce are in the order of 10% of the final costs of the delivered product. Road-induced freight damage prevents transportation of some fresh produce that are prone to damage, such as ripened soft fruits. This adds a cost as these fruits typically are transported at an earlier stage and then stored in warehouses until sold. The high volumes of produce (fruit, as well as nuts) transported in California makes this an issue of state-wide significance. Increased logistics costs due to decreasing riding quality are experienced by most transportation companies in a country. These costs have cumulative effects and will result in massive increases in logistics costs of the country. These increased logistics costs will translate to higher costs of products in the marketplace. Freight movement, with its linkages to infrastructure and vehicles as well as implicit role of logistics, is a national priority in the US as Congress develops a new land transportation bill. In California, goods movement underpins this eighth largest world economy and the 14% of the US GDP generated in the state. In US Senate testimony in early 2011, Caltrans Director McKim (2011) affirmed that the economic health of states like California requires establishment of freight movement as a local and national economic priority. In coordination with the University of California Pavement Research Center (UCPRC), V-PI analyses were conducted for a 3S-2 (articulated) truck on sections of the I710 and US101 located in Southern California. Route I710 is a heavily trafficked route that carries substantial freight traffic to and from the ports of Long Beach and Los Angeles (Average Daily Traffic (ADT) of 155 000 during weekdays, with 13% trucks). The centreline length of the I710 section is approximately 4.4 km with three lanes in each direction (Monismith et al 2009). The US101 between Santa Barbara and Ventura carries rural traffic and is approximately 13.3 km in length. Road surface profiles were measured on both highways for use in V-PI analyses. A total of 660 V-PI simulations were conducted using TruckSIMTM, simulating four speeds and three load levels (10 km/h to 100 km/h; empty to full). Riding quality data was analysed using ProvalTM. Frequency analysis compared the displacement PSD with the ISO PSD classifications to indicate pavement frequency profiles. The riding quality classifications for both roads ranged between 0.8 and 7.3 m/km with the mean IRI being 2.1 m/km and the 90th percentile value being 3.8 m/km. An IRI-value below 1.5 m/km is viewed as good while a value above 2.7 m/km is viewed as unacceptable (AASHTO 2009). More than 70% of the profiles in this study had at least acceptable riding quality values. Based on the ISO classification of PSD pavement profile data, the majority of the pavement profiles in this study were classified as A (46 segments), with a limited number as B (10 segments) and only three segments as C.
The V-PI output data can be divided into tyre loads and vertical movement data. Eighteen individual tyre loads were generated for the 3S-2 truck tyres at frequencies depending on the speed used in the simulation. Changes in individual tyre load are evaluated in terms of standard deviation (STDev) and Coefficient of Variation (CoV) of load data. Analysis of STDev values showed a skew distribution, with the higher values being related to lower load levels and higher pavement roughness. Analysis of axle group load data indicated that the mean tyre loads were related to the static load levels and were not affected by the pavement roughness or speed. STDev values all increased with increasing pavement roughness, decreasing loads and increasing speeds. CoV values were related to the pavement roughness, although the combination of a fully loaded vehicle on a rough pavement (relatively high STDev) can provide a lower CoV than for an empty vehicle on a smoother pavement (relatively low STDev). When analysing specific load cases a similar pattern appears where lower load levels and higher speeds and pavement roughness lead to higher CoV values. These findings are consistent with previous studies (Steyn & Visser 2001). Vertical acceleration and displacement movement of the Centre of Gravity (CoG) were evaluated to determine potential freight and vehicle damage. The STDev of the CoG's vertical acceleration increased directly with increasing pavement roughness for all speeds and loads, for both the truck-tractor and semi-trailer. The STDev of the CoG's vertical accelerations were highest for the empty semitrailer simulations. The half- and fully-loaded simulations showed much lower STDev values at all levels of speed and pavement roughness. STDev values show a dramatic difference in vertical acceleration of the truck-tractor and the semi-trailer, with STDev values for the semi-trailer nearly twice as high as the truck-tractor in most cases. The STDev of the vertical movement of the CoG of the truck-tractor and the semitrailer generally increases with increasing pavement roughness, with a marked increase at riding quality values above 4.2 m/km. Findings from this case study are consistent with the literature. Lower riding quality causes increased STDev of tyre loads, with higher speeds and lower masses causing further increases. The vertical acceleration and movement of the vehicle's CoG are affected in a similar way. This paper examines linkages between diverse aspects of the roadway transportation system with regard to freight movement. Having identified the needs and drivers that affect freight transport costs, the paper discusses damage and its costs to pavement infrastruc-ture, vehicles, and freight. Damage to all three results in higher costs of products to consumers. Investing in improvements to one or more of these aspects ultimately should reduce costs to consumers. Providing lower cost goods also improves a state's and nation's competitiveness in today's global marketplace. This paper focuses on improving the pavement infrastructure through an improved understanding and quantification of V-PI effects. V-PI analyses enable better understanding of pavement roughness impacts on vehicles and freight. The roles and interdependence of pavement, vehicles and freight are complex. On-going freight mobility and related planning efforts in California reflect technical and organisational complexities, which are influenced by integrating different transport modes, addressing land use issues and working with many diverse (sometimes competing) goals, stakeholders, and decision-makers (Scherzinger 2011). A context for discussion of V-PI and freight issues is presented in a three-level framework in Figure 2. The context ranges from localised level (at left in Figure 2) up to state-level and ultimately up to a national/ international level. Tasks, aims, and responsibilities differ at each level. At the local level, vehicle and road owners are responsible for improving V-PI components under their control in order to reduce transportation costs and damage during freight transport. This approach focuses on improvement in the infrastructure for functional as well as economic purposes. Road condition affects all the vehicles running on the road, and therefore investment at this level has a major multiplier effect - much more than investments in improved vehicle components or goods packaging and design. Lower logistics costs also reduce subsequent costs in the economic stream. The second level focuses on a sustainable and effective system by local, regional and state agencies to ensure less congestion and smoother operations in logistics and transport. Examples include dedicated trucking lanes, life cycle analyses, and evaluation of environmental issues. It also may include more freight-focused legislation and regulations to enable more cost-effective freight movement. The third and broadest level focuses on federal, national and cross-border responsibilities for evaluating issues of total logistics costs, road vs rail comparisons, and cross-border flow of goods. A more efficient system should increase a nation's GDP and global competitiveness. An ongoing dialogue on the efficiency and sustainability of the freight transportation system should be maintained, with the focus on developing a long-term vision of sustainable freight transportation for the US. Collaboration should be facilitated on a continental basis among freight industry, transportation experts and stakeholders. This three-level approach is based on the understanding that the responsible entities at each of the three levels focus on improving their own efficiencies in the tasks shown, thereby strengthening the whole system. The recently published performance measures for freight transport (NCFRP 2011) focused on the development of a scorecard to gauge the performance of the US freight transportation system to support investment, operations, and policy decisions by public and private stakeholders. It covers six major categories (freight demand, efficiency, freight system condition, environmental impacts, safety, and the adequacy of investment in the freight system), with the freight system condition category closest to the focus of this paper. A high quality freight system condition requires the best possible roads in terms of riding quality that causes low vehicle and freight damage. One of the causes for deteriorating pavement conditions is low quality construction. Designs may focus on high riding quality with minimal deterioration and maintenance, but achieving these design goals relies on high quality construction. Broad implementation of effective bonus/ penalty schemes has localised effects on better riding quality, less vehicle and freight damage and their associated costs. These localised improvements benefit other freight performance measures, such as efficiency, safety, and environmental impacts at all three levels within the framework. Use of dedicated truck lanes (DTLs) is one approach to improving freight system condition and efficiency. Studies focusing on DTLs in specific corridors (including I-10 coast-to-coast, I-81 in Virginia, corridors across Texas, Georgia, Chicago and Los Angeles) addressed opportunities that could arise from use of new vehicle control technologies to enhance the effectiveness of DTLs. Substantial savings in rehabilitation and maintenance costs could be achieved if trucks drove only on lanes designed exclusively for them. Further improvement would result if trucks consistently followed the same path within a lane through automatic lateral control. The pavement structure could be optimised in ways that are impossible for wandering traffic (e.g. thicker pavement on truck lanes, etc). Longer vehicles and electronically coupled "platooning" of trucks could also improve freight productivity of the highway system (Browand et al 2004), as well as improving safety and congestion (Roorda et al 2010; Samuel et al 2002). DTLs, freight performance measures, V-PI analysis, maintaining road smoothness, and economic assessments typically are addressed by an array of specialists working in their own respective fields. The analysis, discussion, and framework in this paper illustrate the interconnectedness of these issues and suggests the need for better coordination and a more coherent, multi-specialty approach to improving freight movement. Potential application of the concepts discussed in this paper in other environments (such as South Africa) is currently investigated through efforts such as the SOL study (CSIR 2011). The differences in infrastructure and vehicle population play a role in the detailed application of the concepts. However, the principles around well-engineered planning, construction, maintenance and management of the logistics chain and all its components are as relevant as in the US. Implementation of the concepts presented in Figure 2 for the South African context should likewise lead to improvements in the local logistics chain and GDP. ■ The freight transport industry in the US is a significant contributor to state and national economies, with diverse needs and drivers affecting freight transport costs. ■ Properties and complex interactions of pavement, vehicles and freight determine the condition of the freight transport system and resultant overall costs. ■ V-PI analysis tools are available for quantifying physical response and damage for pavement with known riding quality. Results from a case study in California are consistent with international literature showing increased damage to pavement, vehicles and freight as the pavement condition deteriorates, leading to higher operational and logistics costs. These are ultimately paid by customers, reducing economic competitiveness. These tools can help strategic planning, as well as near-term operational planning, for a wide range of priorities in both the public and private sectors. ■ Improved pavement maintenance results in reduced long-term costs for road authorities and induces cost-savings for road users, including freight transport. Improved management of components of the freight transport industry can lead to lower variations in tyre loads and acceleration levels of vehicle components and freight. Investments in these improvements can be investigated by applying V-PI analysis to evaluate response and damage to pavement, vehicle and freight that would result from various alternative levels of pavement riding quality. Results could also provide insights about effects on other drivers of freight transport costs, such as energy costs and environmental impacts. ■ The proposed framework for V-PI, freight damage and logistics provides a context of explicit tasks, aims, and responsibilities for the scale of various spheres of influence. Use of such a framework might help to foster better coordination and a more coher-ent, multi-specialty approach to improving freight movement and, ultimately, improve cost-efficiencies, reduce costs to customers and enhance economic competitiveness. ■ The significance of this study should be expanded through additional studies incorporating a larger range of vehicle types, road conditions and economic areas. Financial sponsorship by Caltrans in the development of the concepts discussed in this paper is acknowledged. PROF WYNAND STEYN is a professional pavement engineer with a research interest in vehicle-pavement interaction, accelerated pavement testing and pavement materials, and instrumentation. He obtained a PhD in Civil Engineering from the University of Pretoria in 2001. He spent 19 years with the CSIR (Council for Sdentific and Industrial Research) in various positions, and is currently associate professor of civil engineering (focusing on road pavement related subjects) at the University of Pretoria. Professional activities include academic and industry research in the areas of pavement engineering, vehicle-pavement interaction and pavement materials. He has authored and co-authored ten journal papers, six book chapters and 50 conference papers. PROF CARL MONISMITH has been a member of the Department of Civil and Environmental Engineering at the University of California, Berkeley (UCB), since 1951. During the period 1974-1979 he served as Department Chairman. Currently he is the Robert Horonjeff Professor of Civil Engineering, Emeritus, and recently retired as Director of UCEi's Pavement Research Center Professor Monismith is internationally recognised for his work in the fields of pavement design and rehabilitation, and asphalt paving technology. He has been active in many professional societies, including the Association of Asphalt Paving Technologists, Transportation Research Board, International Society for Asphalt Pavements, and American Society of Civil Engineers. He is a registered civil engineer in California and a Member of the National Academy of Engineering. WILLIAM NOKES is SeniorTransportation Engineer in the Division of Research and Innovation at the California Department of Transportation, with 30 years' experience in transportation engineering and research in the areas of pavements and the environment. His career includes engineering experience in state-wide government, as a consultant to cities, counties and airports, and at the University of California. Through extensive consultation with pavement engineers and others worldwide, in the early 1990s he initiated the development of an accelerated pavement testing programme in California called CAL/APT. The programme was later expanded and renamed the University of California Pavement Research Center (UCPRC). DR JOSEPH HOLLAND received his Bachelor's and Master's degrees from the University of Notre Dame and his PhD from the University of California, Davis. He currently manages the pavement research programme at the Department of Transportation, California (Caltrans), and teaches at the University of Califomia, Davis. Priorto this he was a research engineer in waterfront structures for the Department of the Navy. He participated in over 40 papers while with the Navy and Caltrans. PROF JOHN HARVEY is at the University of California, Davis (UCD). He is Principal Investigator for the UC Pavement Research Center (UCPRC), wh ich is a joint effort of Caltrans, UC Davis, UC Berkeley, Dynatest Consulting, CSIR (South Africa) and other universities and organisations. He was co-principal investigator and project manager for the Caltrans Accelerated Pavement Testing Program (CAL/APT) between 1994 and 2000. He teaches pavement design, materials and rehabilitation, and project management. He has been with UCD since 2 0 02, and prior to that worked at UC Berkeley for 13 years and for four years in Nigeria and Texas. He is a registered professional engineer in California. Nicholas Burmas, as Chief ofthe Office of Materials and Infrastructure within the Division of Research and Innovation, is responsible for managing the California Department of Transportation pavement research programme that performs over $6 million in pavement research projects each year. He has contractual and project oversight of the Universityof California Pavement Research Center, which has gained national recognition for its accelerated pavement testing research performed for the Department. His responsibilities within the Department include implementing policy and procedures relative to research, reviewing research and related assessments to ensure the successful development and deployment of innovative transportation solutions.